This big, yellow bay window caboose was built in January 1956, part of a group of 35 constructed by the International Railway Car Company of Canton, Ohio, between November 1955 and February 1956 for the Western Pacific Railroad as Nos. 426-460. These were the first steel cabooses built for the WP. International Car was a major builder of cabooses for the railroads until the end of caboose service in the 1980s, and additional WP cabooses came from the same source in 1969, 1973-74, and 1980. Caboose No. 449 and its sisters could be seen all over the Western Pacific system. In 1981 the WP was acquired by the Union Pacific. Caboose No. 449 was taken to Pocatello in June 1984 for a major servicing, where it probably received its Union Pacific yellow paint. Because of legal car trust requirements it retained its WP reporting marks, although it was placed in UP caboose class CA-14. Its last service in 1985-86 appears to have been on the Reno local. New rules from the Interstate Commerce Commission in the 1980s allowed for the replacement of cabooses with an automatic box placed on the coupler of the last car, and railroads quickly moved to eliminate cabooses from service. 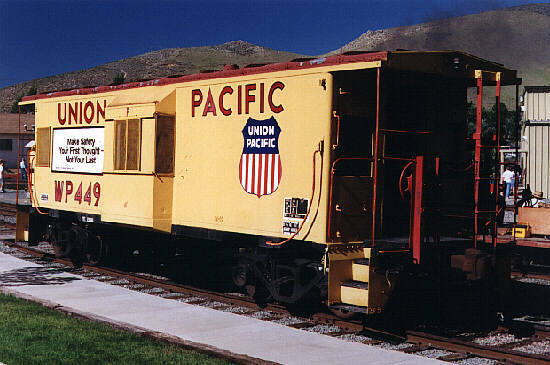 Around 1986 the Union Pacific Railroad donated WP caboose No. 449 to the Nevada State Railroad Museum, and it was trucked to Carson City. Weighing 49,600 pounds, it is one of the heavier pieces of equipment at the railroad museum.